LSEV is the brainchild of Shanghai-based 3D printing materials company Polymaker and Turin, Italy-based electric car startup XEV. The car has a max of 43 miles per hour and can go up to 93 miles on one charge at a price of $10,000. The slow speed won’t be much use for highway driving, but will allow for of city or local driving. Every visible component is 3D printed except the chassis, seats, and glass. 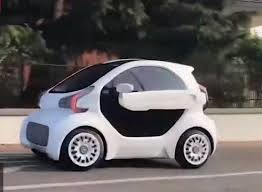 At eight feet long, four feet wide, and five feet high, (it) looks like a Smart Car, but is even smaller. Cars have gone from “get me from point A to point B by burning gas” mode of transportation to a dream project for innovative techies. Cars can now run on electricity, be summoned by smartphone apps in cities all over the world, and are being developed to navigate without a human behind the wheel. And now, they can be 3D printed too. Two companies recently announced the release of LSEV, a small electric car whose every visible component is 3D printed except the chassis, seats, and glass. At just eight feet long, four feet wide, and five feet high, the LSEV looks a lot like a Smart Car, but is even a little bit smaller. LSEV is the brainchild of Shanghai-based 3D printing materials company Polymaker and Turin, Italy-based electric car startup XEV. The car reportedly has a max of 43 miles per hour and can go up to 93 miles on one charge. The relatively slow speed means LSEV won’t be much use for highway driving, but the 93-mile range will allow for a good amount of city or local driving. A great example of a vehicle that drives a lot but doesn’t drive too fast is your neighborhood mail delivery truck. As it happens, one of LSEV’s first large orders came from Poste Italiane. The Italian postal service provider reportedly wants 5,000 3D printed electric cars. An additional 2,000 LSEVs have already been ordered by ARVAL, a car-leasing company owned by French banking group BNP Paribas. While LSEV isn’t the first-ever 3D printed car—American companies Local Motors and Divergent 3D each have their own versions—it is being marketed as the first one that’s mass-producible. LSEV’s production is scheduled to start in late 2018, with the first deliveries for the European orders taking place by mid-2019 at a price of $10,000 apiece. Printing the parts for one car and assembling them into a finished product currently takes three days. This may sound like a long time compared to, say, 3D printing an entire house in one day, but it’s about on par with the time it takes to manufacture a regular car, estimated to be 30-35 hours. Just trade out stamping, welding, and painting for printing, metals and rubber for enhanced nylon, polylactic acid, and rubber-like thermoplastic polyurethane. Even if a lot of time isn’t saved in LSEV’s manufacturing, with just 57 parts, it’s undeniably simpler than regular cars, which average over 20,000 parts (that’s counting every last screw and bolt). Many cities around the world have been built in such a way that cars are an indispensable part of them, especially in the US. Being able to produce cars more quickly and cheaply, then, is mostly a good thing, especially when the cars are electric. But taking a longer-term view, it’s worth considering whether faster, cheaper, simpler car production will serve us down the road. One glimpse of highways or city streets packed bumper-to-bumper with honking, stressed-out drivers is enough to make you wonder if there’s a better way. Of course, this doesn’t mean innovation in the auto world is going to grind to a halt. But it’s nice to think there are likely people out there working on 3D printed electric bikes, better public transit, and new car sharing and ride hailing solutions, too.